We decided yesterday that since we’re in St. Louis, we should try to see some Clydesdales. 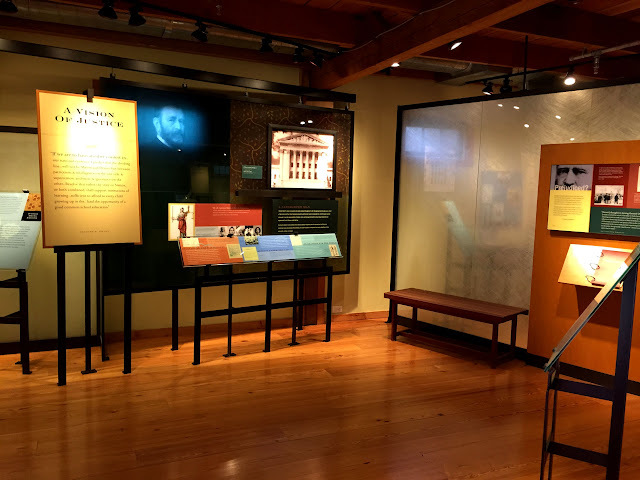 After all, this has been the home of Anheuser-Busch since the brewery was founded in the 1850s. And since 1876, Anheuser-Busch has been brewing Budweiser beer. 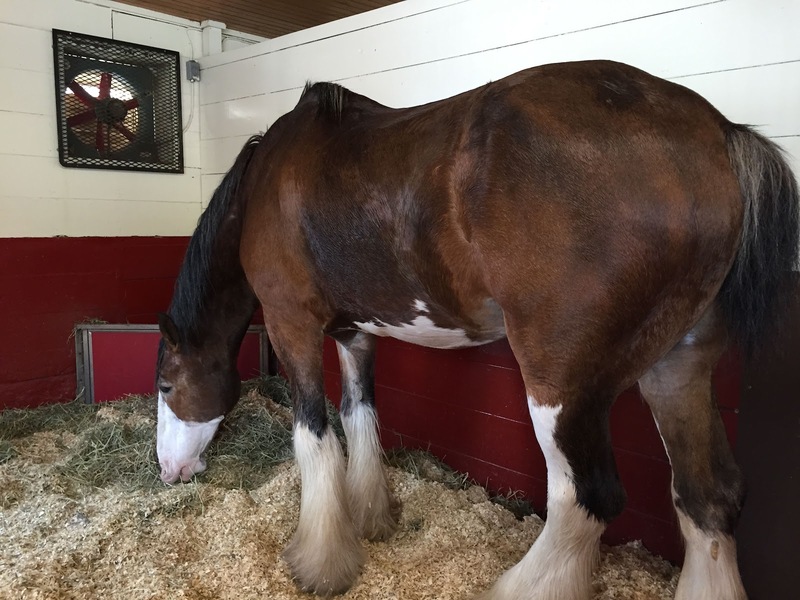 And since 1933, Budweiser has been associated with Clydesdale horses. The “Budweiser Clydesdales” were introduced as a marketing strategy in promoting the brewery’s products after the end of Prohibition. 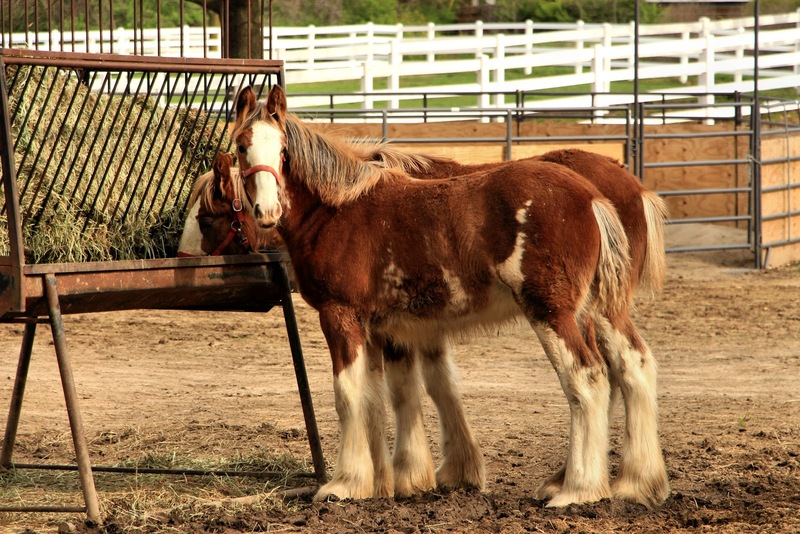 Today many of the Budweiser Clydesdales are raised at Grant’s Farm, a historic Busch family farm outside St. Louis. In addition to breeding horses, the farm also operates as an animal reserve and is open to the public part of the year. Today happened to be the opening day for the farm's 2015 season. Foolishly, we thought an early arrival would help us avoid any crowds. We were quite mistaken. By the time we got near the farm, it was 9:10, just ten minutes after the opening time. Yet we fell into a long line of cars waiting to park in a lot that was already three-fourths full. After parking we found the location of the Clydesdale stables and waited a few minutes for the barn doors to open for the day. As we were to learn, the horses had all just been fed, and since their feed troughs were at the opposite end of the stall from the viewing spot, we were treated to the sight of lots of horses’ behinds. Outside in the pasture, we did get a look at a couple of foals. Since we had other things planned and weren’t really interested in looking at the caged camels and zebras and elephants—oh my!—we decided to move on. Our next stop was just across the road from the farm zoo. 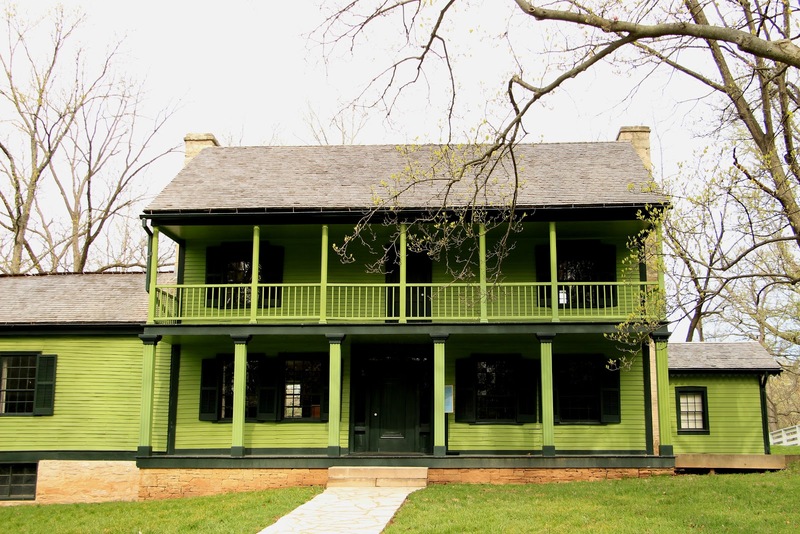 It was the one-time home of the Grant whose name is attached to the farm—President Ulysses S. Grant. Upon his graduation from West Point, Grant was assigned to a military post near St. Louis. While stationed there, he visited his academy classmate on this farm, where he fell in love with Julia Dent, the classmate’s sister. After they were married, Grant and his wife made the farm their home until 1860, when they moved to Illinois. 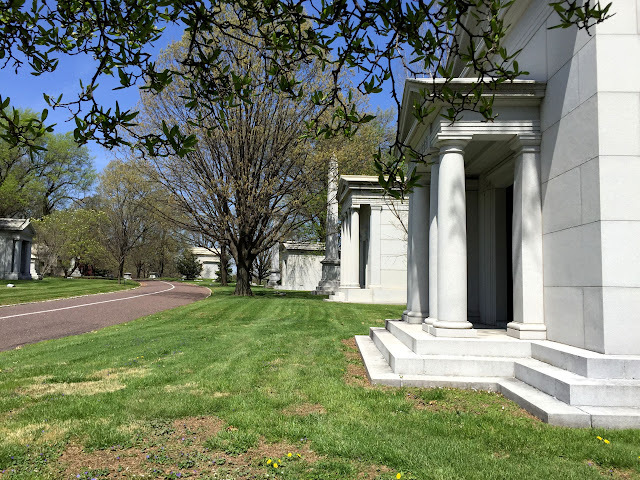 Though the farm remained in the Grant family for many years, they never returned there to live. Today the house and several outbuildings are preserved as a national historic site, operated by the National Park Service. From the Grant site, we drove back to Bellefontaine Cemetery to search for some letterboxes planted there by a couple of local boxers with permission from cemetery officials. 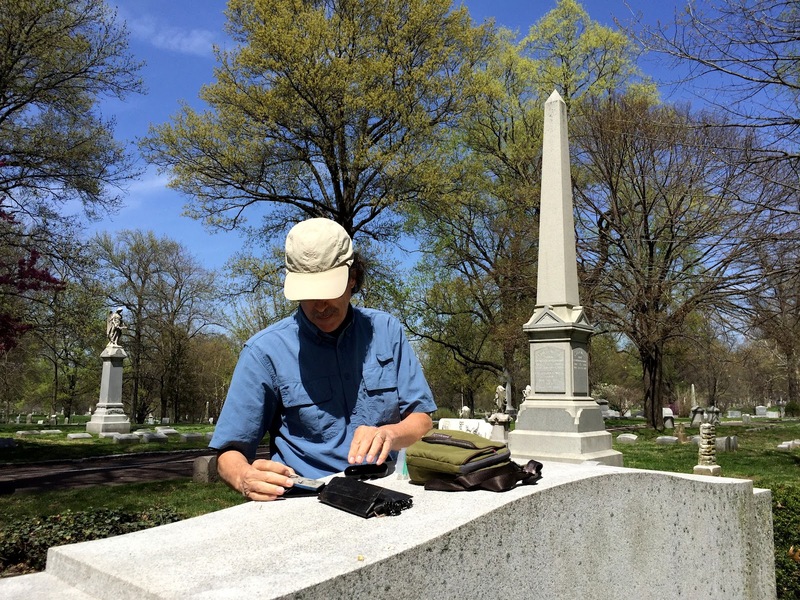 We found 15 of the 16 boxes we were seeking, and they were exemplary—tributes to individuals buried in the cemetery, with clues that revealed information about the life of each person and outstanding stamps related to each tribute. Our letterboxes found and duly stamped, it was time to listen to some blues music. We started at Hammerstone’s, a local bar in a 19th century building that housed a speakeasy during Prohibition. Featuring live music seven days a week, leaning toward the blues genre, Hammerstone’s is an important player in the local music scene. This afternoon’s band was Rich McDonough’s Rough Grooves Blues Band, with Rich on guitar and some great vocals by bassist Sharon Foehner and harmonica player Eric McSpadden, a long-time fixture on the St. Louis blues circuit. They were playing on a patio stage, and it was a smooth, Saturday afternoon, relaxed atmosphere. Before long the tables were filled, with a number of patrons bringing their dogs. 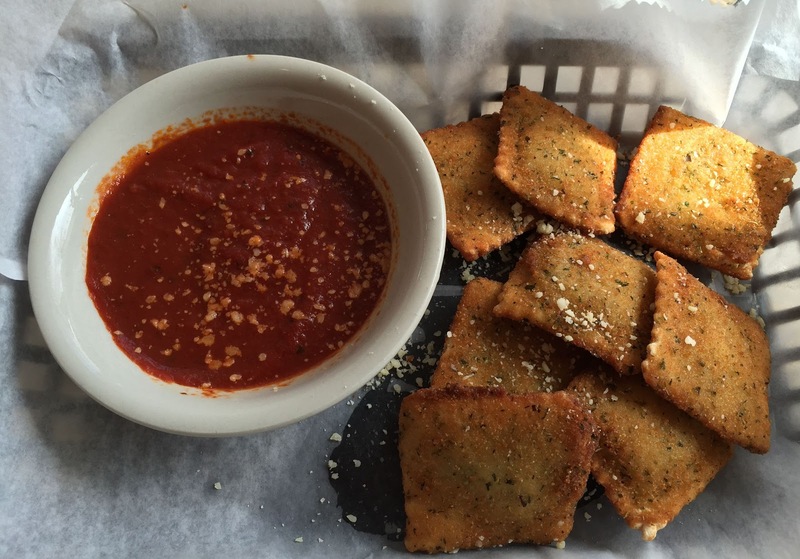 For our late lunch, I tried a St. Louis specialty—toasted ravioli served with a thick, rich, spicy marinara sauce for dipping. My, oh my! It was definitely a comfort food kind of dish, one that you knew was unhealthy, that your doctor would insist that you avoid, and yet—even knowing all that—you couldn’t stop yourself from savoring every delectable bite of that culinary contraband. In the interest of full disclosure, it should be noted that the "toasted" moniker is a blatant falsehood. These crispy little pockets of cheese are breaded and fried. I did mention that they're a St. Louis tradition, right? Even though we were on the patio, the air grew thick with both cigarette and cigar smoke as the afternoon wore on. So when the band took a break, we took our leave and drove over to The Pour House on Washington Avenue. 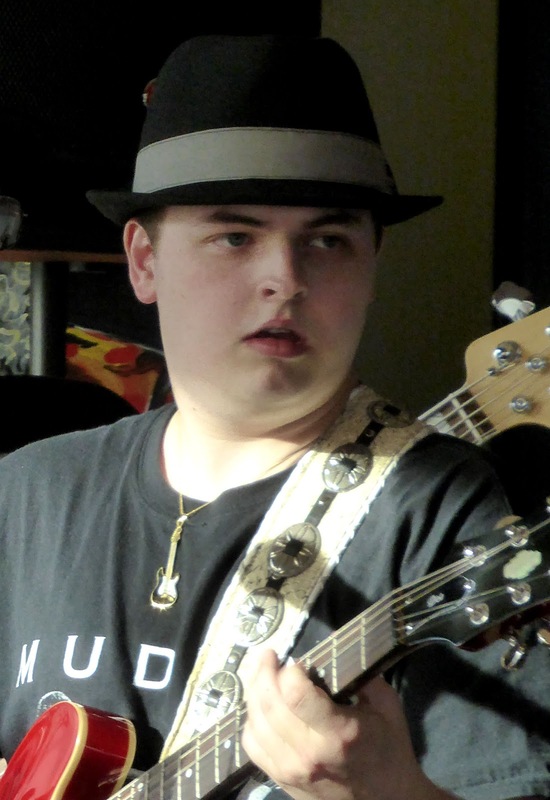 Matt “the Rattlesnake” Lesch, a 17-year-old baby-faced high school junior, and his band were playing the Pour House’s Saturday Afternoon Blues session. Lesch has been called a blues prodigy by some, but he has a way to go to live up to his self-styled “Rattlesnake” persona. No doubt he can coax some mean licks from that guitar and he’s not bad on the harmonica, but his voice still has some maturing to do. However, drummer Marty Spikener helped out with some smooth and seasoned vocals. The band finished their set just before 7 p.m., and we took that as our cue to leave and check out BB’s Jazz Blues and Soups on Broadway, where we thought another blues band was starting up at seven. When it turned out to be jazz, the hostess graciously refunded our $10 each cover charges—the first we paid today—and the bartender didn’t charge us for the drinks we had only started. Quite impressed with their handling of our disappointment, we hope to return there some day. Having reached the end of our Saturday musical agenda, we picked up dinner at Whole Foods and called it a day. 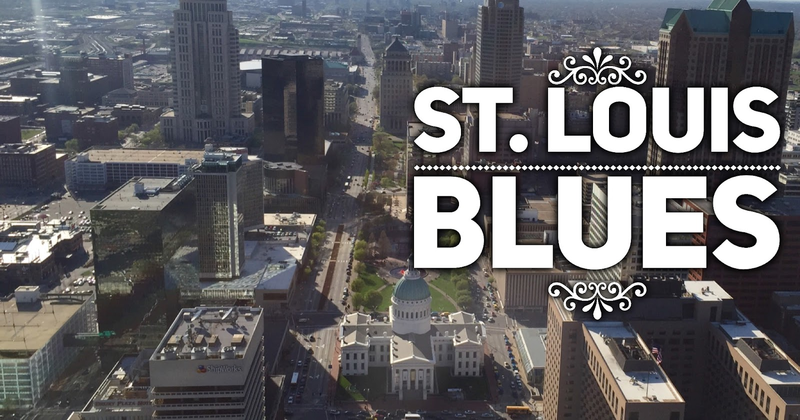 We plan an early start tomorrow to take advantage of some quiet Sunday morning time downtown in the hopes of snagging some unobstructed and uncongested photos of a few St. Louis landmarks. 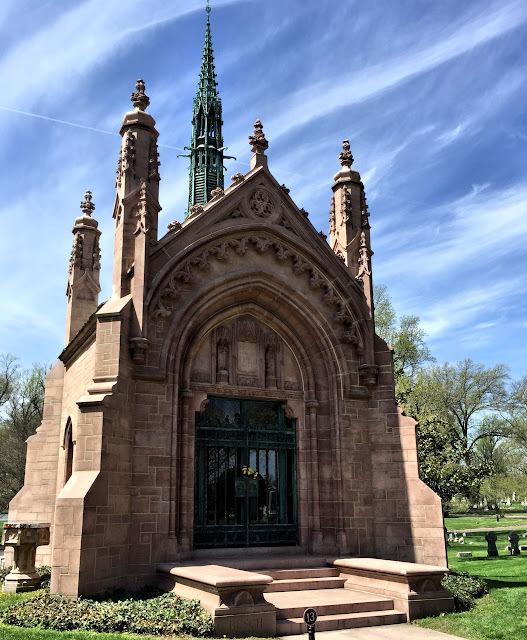 Elaborate Bellefontaine mausoleums look like a street of mini-mansions.